I have a fun makeover for you today! Seems like it’s been a while since I shared a makeover, probably because I’ve been knee-deep in my kitchen redo for what seems like forever! …and then you get this instead? Um, nope. Not. Even. Close. So here’s the thing, last year I made over the cutest little vintage tool caddy using this TAP (Transfer Artist Paper) to transfer an image to the front. The post was titled: One Little Caddy that I Almost Ruined. That should have been at the forefront of my mind when I had the idea to try it again. I swear, I must have crafter’s amnesia. Either that or I was wishing on a star this time would be different. Nope. No go on woodo! But you know what it works amazingly well on? FABRIC! Sometimes the most fun projects come from big fat fails! Then I used the same process I used to transfer a pretty graphic onto my Men’s Valet Stand turned Pretty Stool. I share the how-to in that post. I used the TAP paper once again. See how beautifully it transfers to fabric? I found the graphic using the keywords “Round Paris Graphic” and it links to this site, but she doesn’t recall where she found it. It’s tough when you find it in a search, so if you know where this came from, please leave me a message so I can give proper credit. I used a staple gun to attach it to the underside. Then I started making my drop cloth rosettes. A lot of them. I attached my rosettes as I made them, so I could make sure they were uniform in size. Hot glue hurts. I may have lost the ability to be identified by my fingerprints. It’s the perfect height for my dressing table! 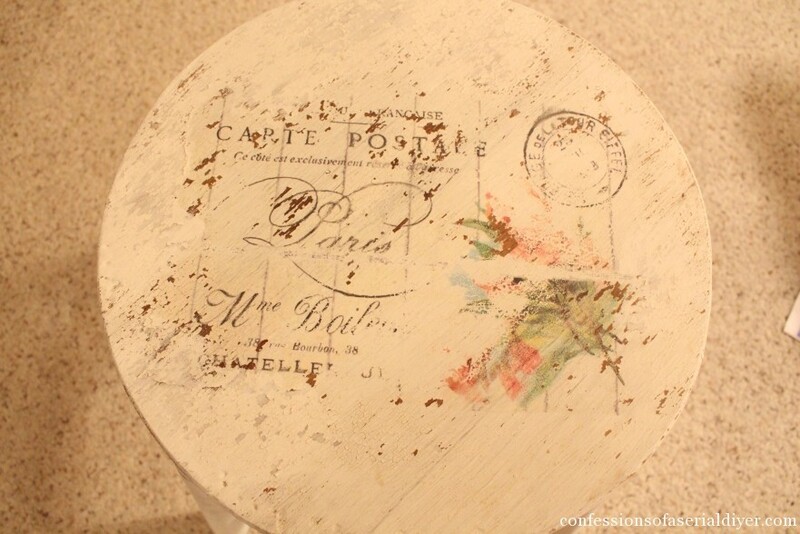 This was created as part of a Travel-themed furniture makeover challenge, hence the original idea to transfer a pretty French post card to the seat. At least it still says, “Take me away to Paris!” Right? Sort of? A few of my favorite blog friends are also in on this challenge. 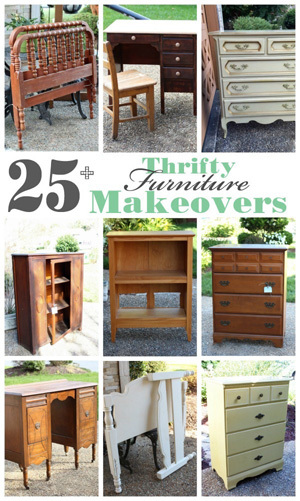 Be sure to check out their fun furniture transformations too! You took this stool from drab to elegant. 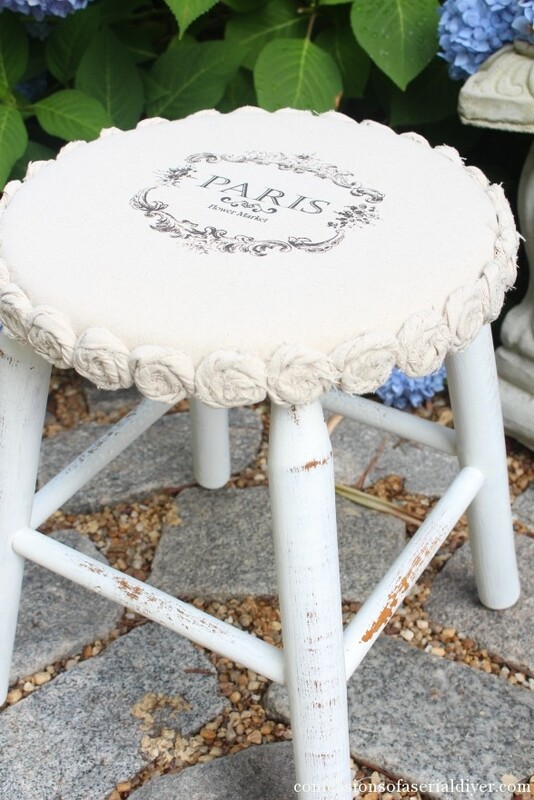 I never would have thought to add rosettes to the stool’s side and I absolutely love that feminine touch. Oh my goodness! I LOVE this! I’d say that is a successful fail! Wow, it is beautiful. I am going to pin this! 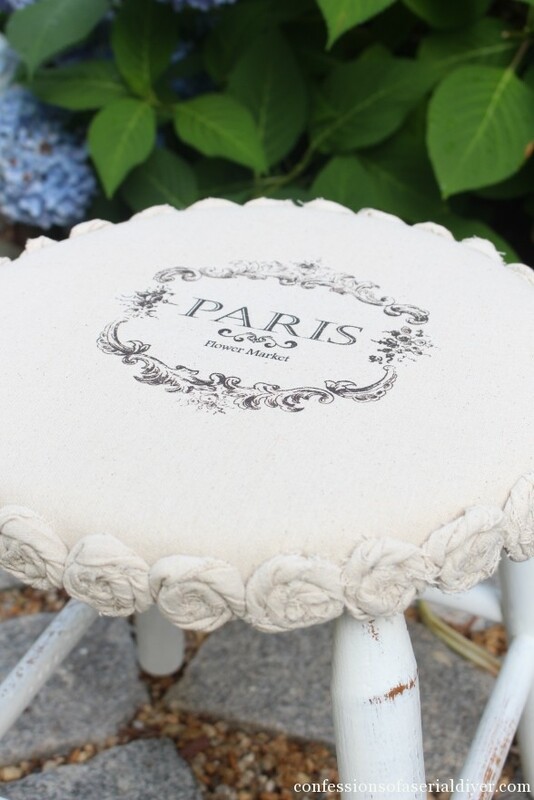 I really, really love your Paris stool. Those rosettes look like a lot of work. But I have to say I liked the transfer art too! Ha ha…glad I’m not alone! That glue could be a weapon! It turned out great. I’ll never look at a beat up stool the same way again. I think you AMAZING, and I get super excited when I see a new facebook post from you! A couple of days ago I read your step-by-step on how you did your kitchen. It just so happens, that day I was planning to begin my kitchen project. After deglossing and sanding for (seriously) 6 hours, I began painting the dark, chocolate brown color I had chosen. Turns out, it looked horrible next to our jet black appliances, so guess what I’m doing now….WHITE! I’ve probably referenced your step-by-step guide 10 times in the last 2 days. I love your cute little stool! Just perfect for the table! 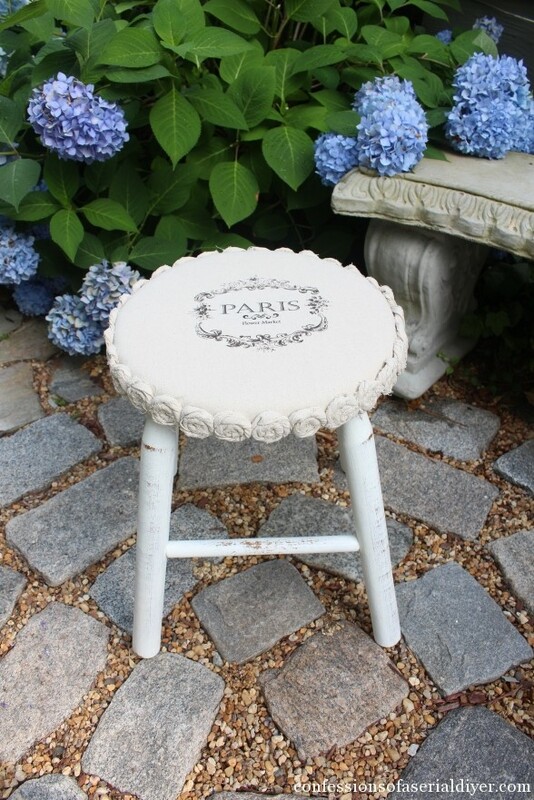 Though I am not into anything that says Paris, I do adore the rosettes and love how this little stool came out. I am a true believer that if a project ruins, then something even better will become of it, why? because it has happened so many times to me. 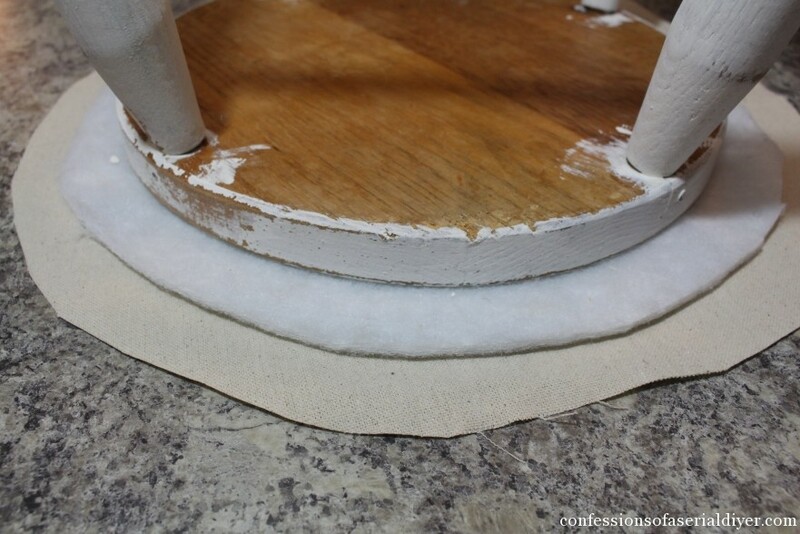 I know that if I hate the look of something as I am transforming it, I will love it even more when it is done because it will be awesome…like you stool! wonderful re do!!! I’ll try something similar! Most amazing $5 stool ever! Christy, I’d say your flop did you a big favor because this turned out even cuter than your original idea!!! I’m in the’no identity’ boat with you… just recovered a lampshade with burlap and burnt every. Single. Finger. Tip…. You think the FBI will eventually ban hot glue because of the damage we’re doing to our pinkies?? 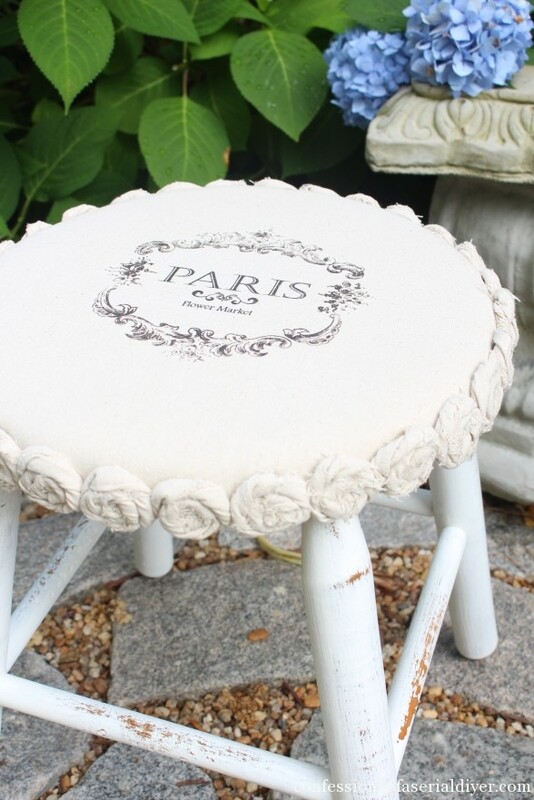 Christy….that is the cutest stool makeover ever!! You come up with the best ideas!! I love TAP paper and have tried (w/o success) to transfer to wood too. 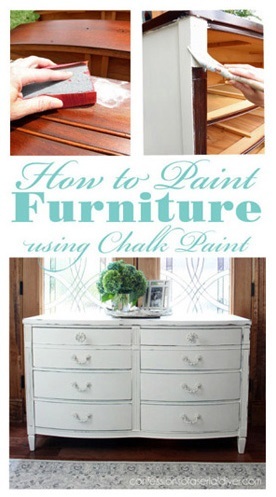 I recently bought a vanity/dresser similar to yours without a chair, so I’ll just redo a stool to pair with it…perfect! 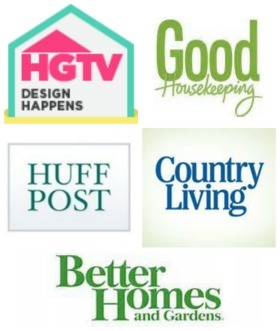 Thanks so much for all your recent kitchen inspiration, also….have a great weekend! Love it Christy! 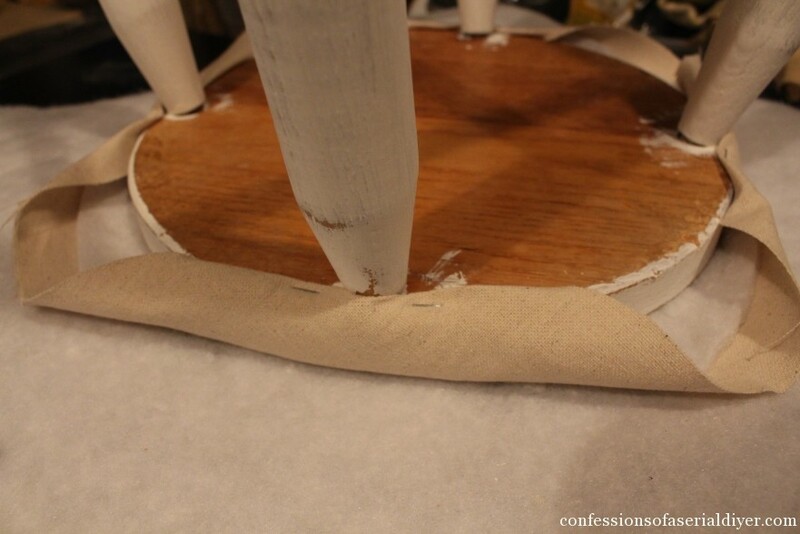 I bet you had some major glue gun burns after this one! So pretty! Very, very, very cute. I love it. Your stool turned out soooo darn cute! Great tutorial on how to do it all. I love everything drop cloth. Thanks so much for stopping by the check out my Make it Stick (krylon) video. Your comment was very sweet! Thanks, Melinda! I appreciate the pin too! This is so pretty! Love how it turned out. OK- your image transfer came out perfect! I will have to look into that transfer paper. Too bad it didn’t really work on wood though, I’ve been searching forever for a good (easy) transfer method for that too. 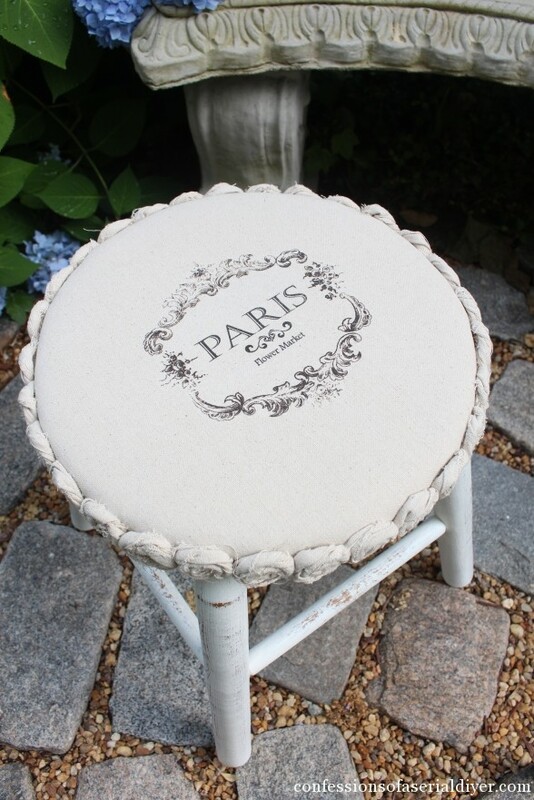 The stool is adorable and those rosettes are so sweet- I can tell you really put a lot of effort into them! So stunning! I’m glad your first draft flopped… I got to see this beauty emerge! Featured you on I Love That Junk this weekend. 🙂 Thanks for linking up to Party Junk! I love this drop cloth craft, Christy! I’m pinning to my Drop Cloth Dreams board. Love Love Love this stool. I am on a hunt for one now. So cute. I would jus about bet that the image came from thegraphicsfairy.com. She has scads of free images. Enjoy! Oh Christy, it is soo pretty!! Wow! 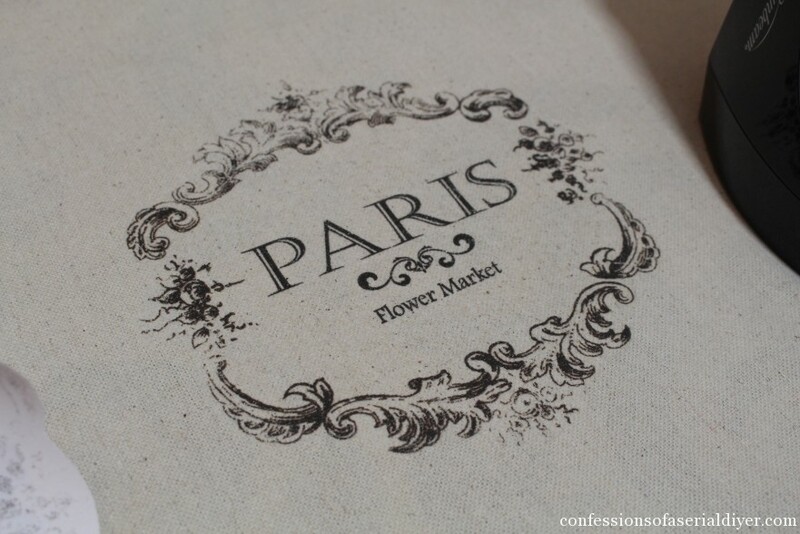 The roses and that Paris stamp make it look soo sophisticated!! I often make the rolled flowers for my daughter’s hair clips but will have to attach them to some projects! Would love for you to come “party” with us again… The link up is on my blog now. I featured your beautiful kitchen this week! 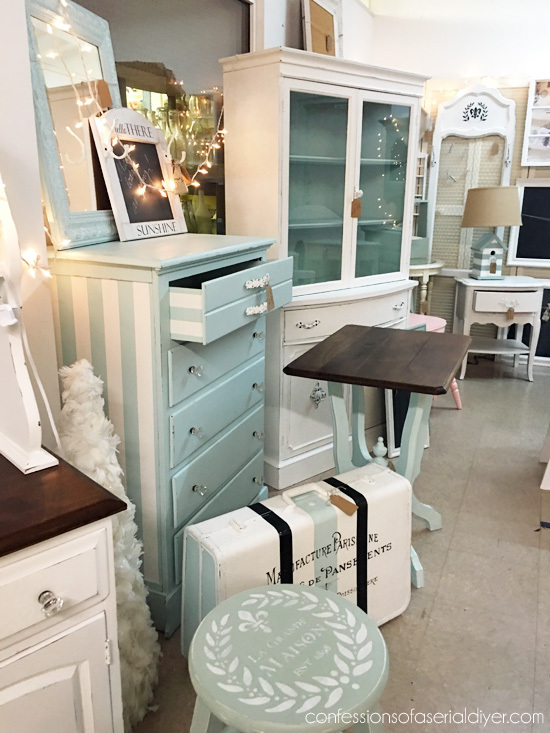 Christy, I love what you did with This stool and I was drooling over your dressing table! Gorgeous! I too have had my share of failures with image transfers. Every time, I think it will work, and it never does. I will have to try it on fabric next time:). I’m choosing your stool as my feature his week on Thursday S.T.Y.L.E. Thanks for linking up with us! You are amazing! Not only can you get these fabulous projects out, but you have such amazing tutorials to go with it. I definitely have to make this, it is adorable! I am quite familiar with the hot glue and missing finger prints process myself…. Hey, I have a question for you, if you are interested in participating in a blog tour, very minimal work, but great exposure. Anyhow…I can’t find your email, can you message me? I love this! 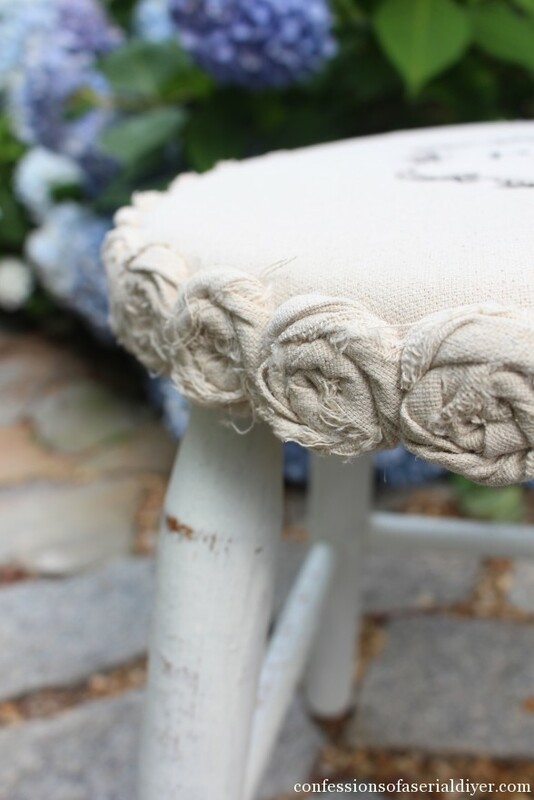 The rosettes add so much to this stool and simply makes it over the top gorgeous. I am planning on redoing a headboard with painters canvas and you’ve now inspired me to add the rosettes to it. I’m so excited to try it. You’ve now got a new follower and I’ve totally pinned this gorgeous project! Did you still wonder where the French graphic came from? I think it is from “the graphicsfairy”. She has thousands of free ones. I think your stool is adorable. Super cute Christy!! Love the travel themed ideas! Hot glue is SO mean. But that stool is awesome. Can I just move in and live in your hydrangea bush?? That glue made bad words fly out of my mouth. This is just fabulous! 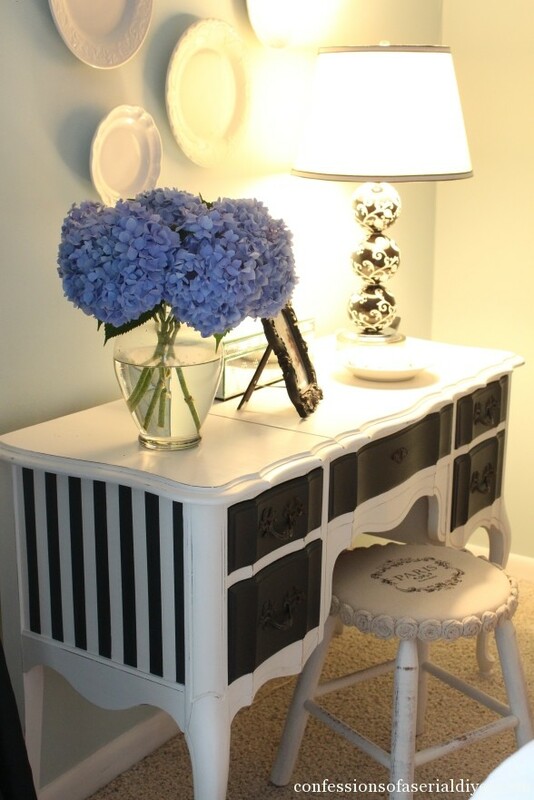 I LOVE this little makeover, the rosettes really make it, and it is perfection as your vanity seat. I love it!!! Please share with us at WIW, we’d love to have you! 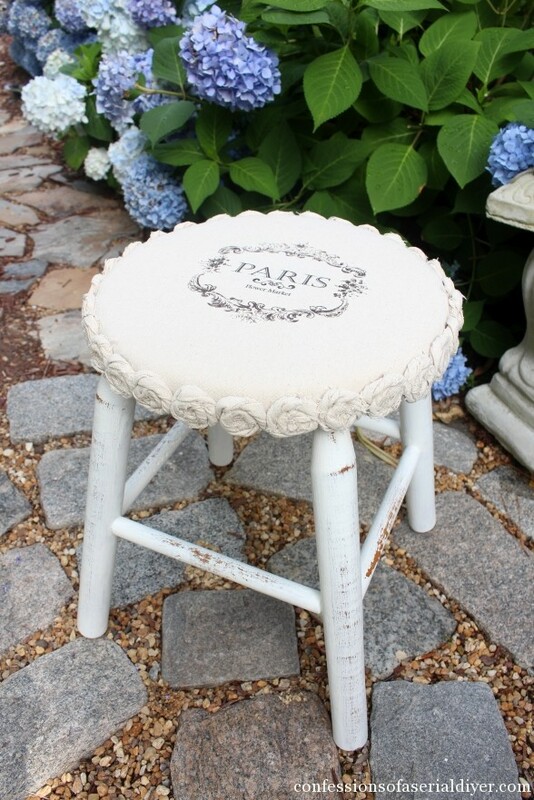 Christy, this stool is so darn adorable! I have a taller one I don’t know what to do with. I’ve had a couple fails as well that in the end turned out fab. 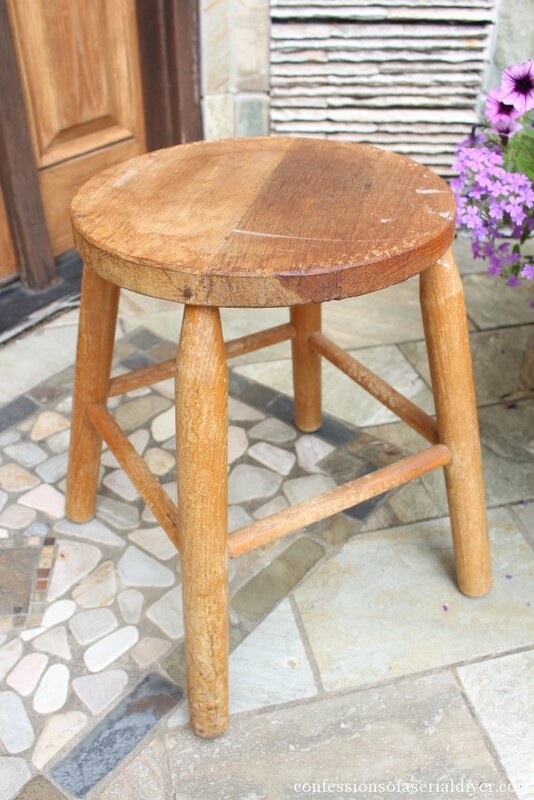 I love, love this stool! Such a beautiful idea.. I may have to find a stool now. 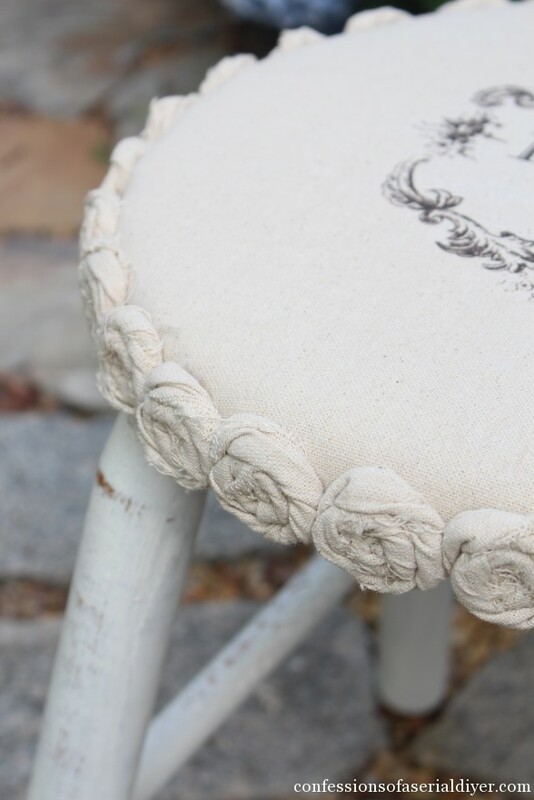 Christy, I adore this sweet little stool and those rosettes are simply gorgeous. Thank you for linking up at Shabbilicious Friday. I’m delighted to be featuring you at the party tomorrow. Christy, I adore your “flop”…it is just the sweetest! I love the roses around the edge. So cute. How adorable! Love the graphic. It gives it that extra special touch. 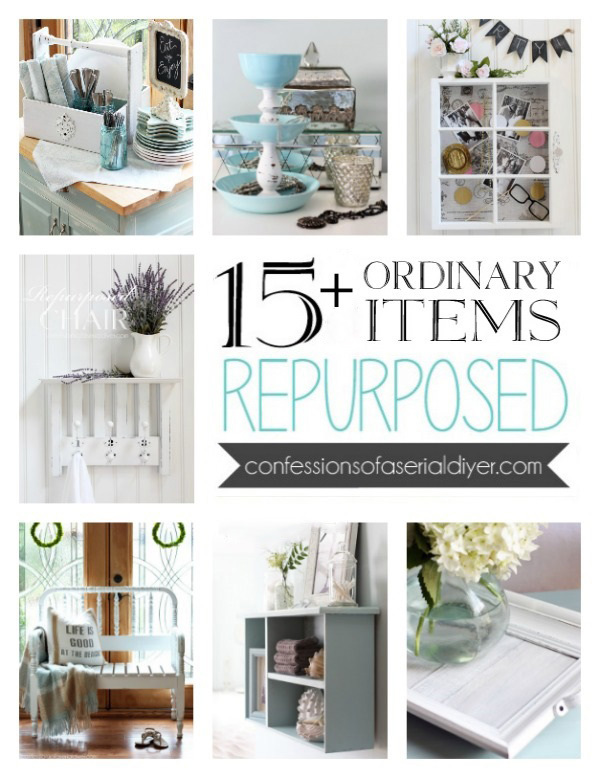 Oh Christy – this is the sweetest thing – pinning !!! I love this stool. I have so many different stools around that I could redo. I have drop cloths also, just because I like them. Enjoyed your blog. You are like seriously AMAZING. I just love what you do, your ideas. 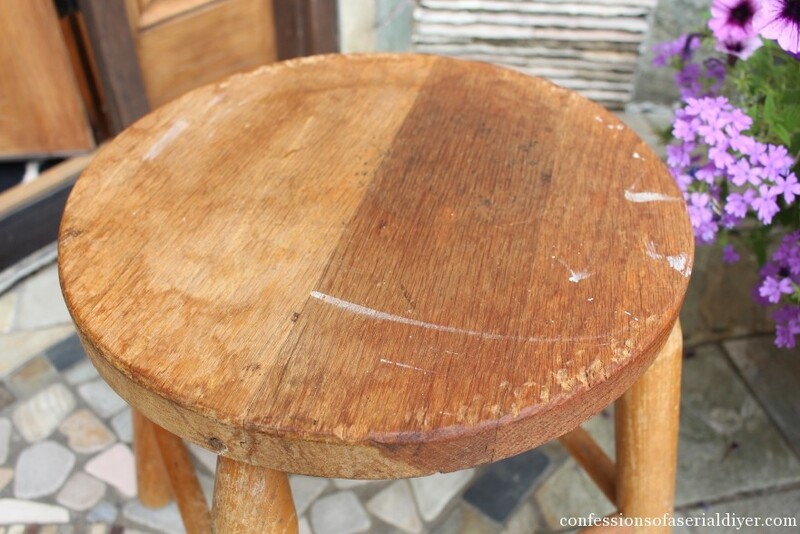 Incredible makeover from a simple stool. I would have no idea. LoL. I’m learning though, and will try something soon! !